We got up early to get to the Gate on the Flood Tide. Half Moon Bay harbor is really protected and we were lulled into thinking that this was going to be a smooth trip...but tha t quickly changed! The breakers on the outside of the breakwater were huge!! The channel is clearly marked to take you aw ay from the shallows that create these big guys, but for a minute there, it had me going! It still was pretty intense, but at least they weren't breaking over us!!!! Once we were in the shipping channel, things calmed down and we were able to rejo i ce, hoot, snoopy-dance, sing (of course) and take pictures coming home under the Gate. Now there were a lot of boats! The Bay seemed eerily calm. It is always calm in October, but maybe it was because we had been through the biggies, or maybe because Wind Spirit is 16 ft longer and 4 ft wider than Zapata, or maybe it was just that calm feeling you get when you come home. We had about 1/2 hr to Richmond Yacht Club to take it all in. Our club was conducting 4 races for the annual Great Pumpkin Regatta that attracts some 150-200 boats of all sizes and persuasions in costumes and all. They always have a good band and this year was no exception..a Beach Boys tribute band. Lots of good food and drink specials, costume contests and parties to the weeeee hours.....weeeee were too tired for most of it, but were able to reconnect with some of our friends with promises of a "boat warming" party. Since there's no slip available for us at RYC at this time, we have to take her to Marina Bay indefinitely. Pretty anticlimactic to go to a strange home, but we've seen nothing but strange homes with Wind Spirit so I guess its OK for now. So, our "Excellent Adventure" is in port for now. Quite an adventure at that...from the Planes, Trains and Busses and the whole Ensenada experience, to the two weeks in San Diego , to the Catalina Adventure and the Harbor Hopping North we've learned a lot about our boat, ourselves and the populations. Our boat is a dream. She handles beautifully and we have total confidence in her. As for ourselves? We've spent 24 hrs a day with each other in a small space, in new places and new situations / emergencies dejour and realize that we have been lucky enough to have chosen the life-partner-soul-mate we hope that you all who are reading this blog have now or will find soon. Predictions of increasing swells preceding a weather system indicating that our "weather window" was closing in a couple of days, we opted to leave Monterey and head for Half Moon Bay today, even though we knew that it would be a 10 hr trip. After yesterday's marathon, it was tempting to stay and relax along Cannery Row or take Patty for a sail just for the fun of it, but we were on a mission to get home with the least amount of stress!! It was a strange perspective seeing the coastline that we've driven so many times from the sea. We're definately back in Northern California though, there's a distinct chill in the air and our shorts-and-t-shirts days gave way to XC ski gear and foulies somewhere around San Simeon, and its a bit colder today. Birds were the fauna of this trip! Lots of birds just floating in huge masses and parting for us to pass.... some swim way using their wings as paddles, some run away just on the tops of the wind fluff and some get right up and fly. Did you ever notice that some birds are "walkers" and others are "hoppers"? Check out your backyard someday and you'll see what I mean. Big old pelicans are "hoppers" so when they take off their big-old webbed feet slap on the water for 8-10 slaps before they can get their big-old-selves airborne! What a racket when you disturb a big bunch of pelicans!! Sorry that my bird pics didn't show anything. Seagulls, Dolphins and Whales...oh my! Ok, so I had pictures of the "Perfect Storm" rounding Point Conception from all of the tales I have heard....I mean...the Cape Horn of California???? What else would you expect? In all fairness, I guess it can be that crazy, but our new friend and mentor on Kemira insisted that we go to Cojo yesterday and he was sooooooo right! Sure, the swells were bigger than I've ever seen but they were far enough apart that it wasn't scary. There was no wind for most of the trip so these big swells were glassy. When the wind did come up, we already had the main up for stability and it added 1.5 kts to our over the ground time! Perfect! And not a storm! Since I didn't sleep so well in the "cradle anchorage" last night, Paul stood watch for the daylight hours and I tried to nap. We had the usual array of sea birds scurrying away on this daytrip, but then whales! Yippie! WaaHoo! I almost ran over them! First it was two, then later two more, and two more. (Whales always go two by two?) Then it was pretty much business-as-usual-boring-old-motoring North for the next 25 hrs.... But, weird things happen in the dark, no moon, no fog, just radar, AIS and really cold eyes. After I relieved Paul from watch at about 10:30 pm things started happening. It took a while to get acclimated to the darkness before the sliver moon came up, but from the corner of my eye I spotted an irridescent, white, bubbly, torpedo stream streaking towards the side of the boat..then there were two..... then they veered off dramatically towards the bow and in one jubilant move, leaped from the water in sheer glee! Dolphins! Playing in Wind Spirit's bow wake! How cool is that???? Then from the other side, then from the first side..... then, as quickly as they came, they were gone....and I could breathe again. (Did I say that weird things happen in the dark?) Later, when the moon came up I saw the glowing globs of the jellyfish drifting by....eeerie...must be heading to a Halloween gig! Of course there were the heart-stopping encounters with the AIS ships....I move one way to avoid them and they mirror my move so we're still about to collide (in an hour). Finally, we have a close encounter in the darkness 1/2 mile away and I can relax again. There is really nothing but total darkness between San Simeon and Pt. Sur except many hours of solitude. They call it "bashing" because you are heading straight into the wind, waves and, often times, current. You had better have your crystal lashed down! (~Or at least the wine~). Just when I thought we would get to spend a leisurely week catching up and visiting with our niece, things changed. This morning as I was working (yes, working) on my laptop in my jammies, someone knocked on the hull of the boat. It was a man Paul met earlier in the week who was a veteran at "Bashing North". He insisted that we go NOW while the "weather window" was open......so, quick like bunnies, we lashed down the wine and headed for Cojo Anchorage, a little cove just tucked in behind the infamous Point Conception...the Cape Horn of the coast. So, we anchored and waited for our mentor to give us the signal to beat feet (or waves) north as fast as our little boat could carry us while the "window" was open. We're getting to know all of the great harbors along the SoCal coast. After Marina Del Rey for 3 days and sail repair, we left for the Channel Islands Harbor and the Pacific Corinthian Yacht Club. They graciously provided us with a reciprocal side tie right in front of their beautiful club. Channel Islands is a new harbor and has some spectacularly large yachts in their large bay. (Wonder what their fuel bill is?) We met a sailor just in from single handing from Hawaii in 40' seas and gale winds!!!! (I'll fly, thanks) Needless to say, he and his bride were celebrating the fact that he was alive with some good wine! As we got closer to SB the kayaks and dinghy's appeared. We're here to provision a few cases of Longboard's hot sauce and some good wine. The evening sunset cruise was the best with our niece and her boyfriend. Here, we hope to get in a couple of days sailing, working (for me) and a couple of days just being slugs before the big bash to Monterey. I think we're here for a couple of days, leaving on Thursday, maybe. Looking forward the 49er game tomorrow...I haven't seen one yet this year!! Ok, after being thrashed around on Friday and Saturday nights, Sunday tricked us into thinking that all was calm..... Enuf is Enuf! We left today at 11 am in 4 ft seas ( in the harbor!) and headed back to the mainland for ANYWHERE that would be calmer. The seas grew ( increase the music here ) and the boat and people thrashed (more music) until..........(crescendo) all was calm. Funny the way that worked..half way through the shipping channel, it was as if there were no winds ever, calm, 1 ft seas, sunny and warm. Once in Marina Del Rey, we searched for the marked slip that was promised us by the Del Rey Yacht Club...back and forth....(you try that in a 46' boat)....back and forth and the one promised had a really pretty trawler in it. So the club bartender ( for those of you who don't know, they are really low on the totem pole) made an executive decision and assigned us a slip right in front of the yacht club. AND, lucky us, we scored on a Monday Night Football and Baseball gig with dogs, burgs, chicken and ribs that the club was Queing. Why is it that you spend all day doing virtually nothing but you're sooooooooo tired when you get done? Another long winter's nap is in close view..... Tomorrow the sailmaker is meeting us in the dock to get us back sailing again. Up early to move on to the Isthmus and get a buoy early. Latitudes and Attitudes Magazine is having a party and expecting lots of boats. The weather forecast is for lots of winds and waves, but hopefully the westerly predictions will hold we'll get a little protection in the harbor. It's a beautiful sunny morning and no fog. This would be a great place to hang out on the hook, snorkeling and going from cove to cove, but that will have to wait until another trip. The harbor patrol had us pick up a buoy on Row D and hooked in bow and stern, with the stern facing out to sea. Alice and Sal and Gloria from D Dock in Ensenada came up to join us for the weekend, arriving on the 2 pm ferry from San Pedro. We dinghyed over and picked them up ( oh, we love our new dinghy) and got them settled into the boat. They brought lots of wine and goodies, so we just had to catch up before heading in to the no-host cocktail party on the deck by Lats & Atts. We ate a little, danced a little and noticed that the weather was, indeed, coming in so we high tailed it to the dinghy while we still could. Wind Spirit was rockin and rolling on her buoys, with the waves splashing on her stern with a loud ~whomp~ every wave. 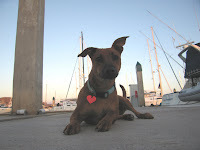 The wind was whistling and howling through all of the rigging of our boat and all of the neighboring boats. It was quite a howl! Soon the wind had increased A LOT and the radio was issuing gale warnings out around the island. This went on all night......6 or 7 boats began to drag their buoys and threaten to smash into adjacent boats...they were ordered to cast off and go to another cove where there was more protection....at 3 am !!! We all were up making sure things were stowed and lashed and generally tied down the best we could, and Wind Spirit held her ground and groaned all night. We were monitoring their VHF radio chatter all night and around 5 am, the harbor patrol boats that had been feverishly working from boat to boat, impending disaster to impending disaster, dragging buoys, and rescuing run-away dinghys, were sending staff home and going to business as usual mode...so we finally were able to sleep once the excitement was dwindling. Waking up to high winds and turbulent seas on Saturday was a piece of cake compared to the night before. We were all sleep-deprived so after a visit to the island and the "seminars" hosted by the Lats and Atts group, four of us came back to the boat for a well deserved nap . Alice, like a good girl, hiked off to the other side of the island to "Cat Harbor" for some exercise and a little snooze on the beach. After all, we need our energy to dance all night at the Saturday night potluck BBQ! Eric Stone band provided fun "cruising" music and then the DJ in the restaurant continued until the weeeee hours. Once again, the wind howled and the breakers rolled through, only we had turned our boat "bow in" to the wind so she rode much better. It was a little less severe than Friday night and we all got a good night's sleep. Today, as I sit here writing this, most of the boats have gone, there are about 6 of us left and it is glassy calm and hot. Sal, Gloria and Alice left on the 2 pm ferry for San Pedro and Ensenada with a sushi stop in between. Its so quiet and lonely on the boat and in the harbor now that everyone's gone! Sal and Gloria will be headed farther south in Mexico and parts unknown next month and Alice will be holding down the fort on D Dock, keeping us all updated on the scoop. Be sure to look her up if you end up at the Coral in Ensenada. Fair Winds and Following Seas to Sal and Gloria and don't forget to drop us a line with your adventures! After mounting our outboard motor hoist, we dashed out of Oceanside at about 11:30 am headed for Two Harbors at the Isthmus on Catalina. We motor sailed across the channel, playing with our new chartplotter and AIS (Automatic Identification System) which locates and identifies the big ships coming our way. Its really cool - it tells you when you're on a collision course with the big guy, and exactly the time of your impending death! Hopefully you steer clear before that happens. FINALLY, we saw some dolphins leaping and frolicking and totally ignoring us.....I kept a keen eye out for whales...but still nothing. 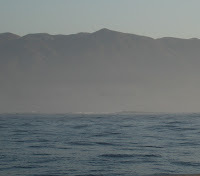 We had fog, moderate waves and 10-15 kt winds and we were skimming away at a fabulous 7.8 kts when we heard a loud POP. Once we picked ourselves back up off the deck from our heart attacks, we discovered that the clew had pulled itself right out of the main sail and the main was flopping wildly. We pulled in the main and continued on under motor and jib and only lost about a knot or so of speed. But we're now officially a motor boat until further notice. Recalculating our new slower speed and distance, we diverted to Avalon Harbor so that would get in and on a buoy before sundown. What a cool little town! Good margaritas too! We've been hanging out here for almost two weeks getting electronic upgrades, a new dinghy and other various outfitting stuff and we're ready to be movin' again. Tomorrow, we head out for Catalina Island for a long weekend. It's a shorter trip, so we can sleep in!!! Yippee!! Even though we were eager to get back to the states and get our boat properly outfitted, it was a bittersweet departure. We made some great friends and met some interesting people in Ensenada and will truly miss them! After leaving the Coral at 4 am Wednesday with maracas shakin...(no not those maracas, the ones awarded by the D-Dock Fun Committee on Tuesday) we motored north for 10 1/2 hours t hrough the dark and the fog. 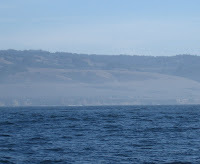 Travelling at about 6 knots per hour through the fog, we managed to avoid the tanker, the cruise ship and the fishing boats for 7 hours and as we approached the Coronado Islands the sun finally came out and we could shed our woolies. The next couple of hours provided hot sun and actual boats to look at instead of fog banks ! What a concept! So, in true D-Dock fashion, we had to crank up the music and crossed into US waters dancing in the cockpit to Tony Bennett and "I Left My Heart in San Francisco". 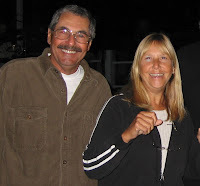 Once in San Diego, we had to wait for about an hour at the Customs Dock for the official, who checked us into the country and we were released to go to our new temporary home at the Sun Road Marina on Harbor Island. Paul gave the locals a show by performing an absolutely perfect drive-by and 87 point U Turn in the fairway inbetween H and G docks checking out our new slip before backing in for the final docking. Way to Go Paul! Wind Spirit is a 2004 Hunter 466 purchased in 2008 in San Diego and brought up the coast to her home port of Richmond Yacht Club in October 2008 after a summer in Ensenada. We'll be heading south with the 2011 Baja HaHa and into the Sea of Cortez and Mexican mainland for some Mexico cruising.